How much does it cost to travel to Victoria? How much money will you need in Victoria? AU$159 ($114) is the average daily price for traveling in Victoria. The average price of food for one day is AU$34 ($24). The average price of a hotel for a couple is AU$182 ($130). Additional pricing is in the table below. These average travel prices have been collected from other travelers to help you plan your own travel budget. Just beneath New South Wales lies Australia's triangle shaped state, Victoria. This region, while not quite as popular as Sydney, is home to another of Australia's popular destinations, Melbourne. Consider that it has all the class and culture of Sydney, without the large crowds. Remember, when planning to visit anywhere in Australia that their seasons are opposite of the Northern Hemisphere. They celebrate Christmas with cool drinks and a day at the beach. Melbourne is home to various 19th-century architectural masterpieces. Today, many of these buildings serve as hotels, theaters, art galleries or anything else to support the culture and arts in this state. Take the time to wander the streets of the major towns and cities in Victoria. Follow those streets to the Australian Center for Contemporary Art and the nearby National Gallery of Victoria International. Both of these venues are free and the artist in you will love it. For more in the art world, travel just outside of Melbourne to the Heide House. It was once the home of prominent art patrons who housed working artists of the 1930s, 40s and 50s. Currently, the house is a museum with three different exhibition spaces and a sculpture park. The shopper in your group will appreciate the markets scattered around the city. Gertrude Street is full of eclectic shops and boutiques, and Dagmar Rousset will have some of the wildest prints you've ever seen. Be sure to find the South Melbourne Market for the best selection of quintessential Australian souvenirs. Also, this area is rich with history. Stroll through Melbourne or towns like Ballarat, Maldon or Beechworth for the kind of atmosphere that will have you thinking you've stepped back in time. Don't end that walk, though, without a wander through the Royal Botanic Gardens. This garden is full of the bizarre and beautiful flowers of Australia all year long. If you're there for their summer, stick around for a movie on the Central Lawn in their Moonlight Cinema. To the southwest of Melbourne is the Great Ocean Road, home of many activities (more below) and the famous Twelve Apostles. The state of Victoria is divided into twelve regions: Mornington Peninsula, Yarra Valley, Gippsland, Goldfields, High Country, Wimmera, Phillip Island, Great Ocean Road, Sunraysia, Mallee, Goulburn Valley and Dandenong Ranges. There is never a shortage of things to do in Victoria. If you're not wandering around and sampling the finest foods in Melbourne, you could easily be doing any outdoor activity your heart desires. Head west for an afternoon with richer wildlife. From Wilson's Promontory to Gippsland's Wilderness Coast, you'll begin to see nature in ways you have never seen nature before. Take a drive along the breathtaking coast of the Great Ocean Road to become familiar with this spectacularly scenic and famous stretch of coastline. 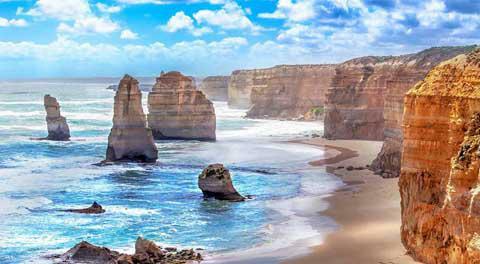 Although the Twelve Apostles are the most famous landmark of this region, it is only one of many spectacular sights. Several local and National Parks in the area are home to wildlife such as Koalas. Hiking trails are prevalent, including the Great Ocean Walk, a hiking trail stretching west from the town of Apollo for over 100km. Over in the High Country, the risky rivers and adventure filled forests make Errinundra and Snowy Rivers enticing to visitors all year round. Some might call Melbourne the foodie capital of Australia. In the state as a whole there is a rising popularity with street food, as they weave in the long culinary traditions of the area. Victorians don't shy away from experimenting with different tastes and treats, and their passion makes from some amazing final products. Also, you can't miss an opportunity to sip on some high quality wine. From the Yarra Valley to Rutherglen, there is plenty to fill a day of tasting. This state is not as vastly spread out as the other states in Australia so exploring by your own car is recommended. The roads are the most developed and well maintained in the country, and the ride is sure to give you pleasant stops and sceneries the whole drive. Victoria also has one of the best train systems in the whole Australia if you're not comfortable driving in a foreign country. The V/Line train services operate in five different regions: Northern Victoria, North Eastern Victoria, Eastern Victoria, South Western Victoria and Western Victoria. To extend services to smaller towns, the V/Line train also connects to coach services. However, if you're simply dying to get active, Victoria is home to several rail trails and bike tours for some more engaging sightseeing. Many railways closed in the 1970s and 80s and have now been converted to trails for biking, horse riding or even walking. The most developed trails include Murray to the Mountains, Bellarine, Ballarat to Skipton and East Gippsland.